Junior Explorer program at The Parklands teaches kids about nature and takes them on an outdoor adventure! Junior Explorer is a program at The Parklands for kids ages 5-12 (www.theparklands.org/Things-To-Do/Junior-Explorer). Its purpose is to teach kids about nature and encouraging them to spend time outdoors. 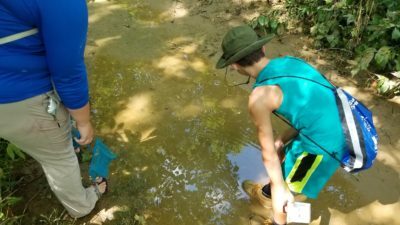 The Junior Explorer program takes place at Turkey Run Park in the Parklands meets every other Saturday, two Saturdays a month. 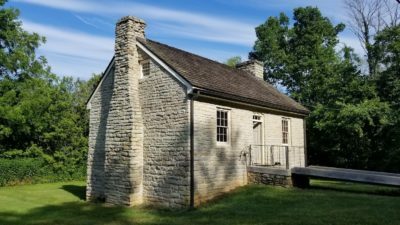 The explorers meet at the Ben Stout House at Turkey Run Park at 10am and the program lasts until noon. (The Ben Stout House has air conditioning, heating and a restroom). During each meeting there is a craft, indoor activity, a lesson and a short hike to look for the wildlife they discussed. There is a different topic each Saturday. 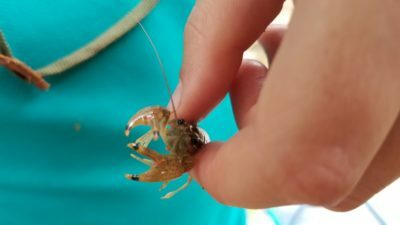 On our visit to Junior Explorer, the topic was macroinvertabrates. The instructor discussed what they were, where they are found, which are sensitive to pollution and other interesting facts. The instructor was knowledgeable, friendly and did great with my super inquisitive son. The indoor activity involved making insects out of craft supplies. Then we went on a hike. We saw all sorts of wildlife and discussed the things they had just talked about at the Ben Stout House. Be sure to RSVP on the website if you plan to attend. Parents are invited to walk with the Junior Explorers through the fields, woods and creeks. Be prepared with comfortable walking shoes, water and a light snack. (Our guide wore water shoes, my son wore hiking boots and I wore sneakers. All worked, but all of us came back with dirty, muddy, wet footwear). The instructor provided guide books, nets, magnifying glasses, sunblock, and bug spray. Parkland Members participate for free and non-members pay $5. The four connecting Parklands Parks are Turkey Run, Broad Run, Beckley Creek and Pope Lick. Right now you can hike, bike and paddle between each park using The Strand, which connects the northern two parks with the southern two parks. There is no roadway access to The Strand, so if you wish to drive between the parks, the route will be different. Each park has multiple things to offer. 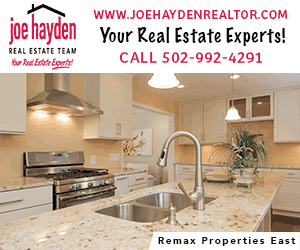 All four have biking and hiking paths and the creek to paddle by canoe or kayak. Turkey Run and Broad Run Parks are next to each other. Turkey Run (where we attended the Junior Explorer Program) is great for hiking and has a Silo Lookout that visitors can climb. Broad Run Park, right across from Turkey Run, has a big playground and splash pad. Up north, Beckley Creek is more for people gathering – it has a smaller playground and splash pad and a dog park. Pope Lick Park which is near Beckley, has a lot of soccer fields. If you haven’t been to the Parklands yet, you definitely need to check them out. You may even want to become a member so your kids can go to programs like the Junior Explorer for free every month. We highly recommend the Parklands programs! For more nature fun, check out our CALENDAR!